Giardia intestinalis was included in the World Health Organization’s Neglected Disease Initiative in 2004 as it may range from asymptomatic to chronic or severe diarrhoea and chronic disorders post-infection. The present study aimed to find out the rate of sole infection of G. intestinalis and co-infection of this with other protozoan parasites among the inhabitants of Barak Valley region of Southern Assam by conventional and molecular detection. A total of 1168 samples were collected from different groups of individuals, all the collected samples were subjected to microscopy after specific staining by Lugol’s iodine solution, Trichrome staining and modified ZN staining procedures. Microscopically positive samples were further confirmed by PCR using specific primer sets. Of the total no. of samples, 267 (22.85%) were positive by PCR for G. intestinalis with a little higher rate of infection in female (24.06%) (OR = 1.2192, CI = 0.9262 to 1.6049) than male (21.27%). The rate of infection is comparatively higher (25.93%) in the age group of 0-5 years (OR = 1.9149, CI = 1.2558 to 2.9200). In 196 samples G. intestinalis co-existence was observed and detected by PCR with some other protozoan parasites like Entamoeba spp., Cryptosporidium spp. and Blastocystis spp. The rate of infection was higher (31.96%) among the participants who collected water from river. Least of the participants showed diarrhoeal symptoms (18.18%) but majority (28.45%) complained for having abdominal cramps (OR = 1.3402, CI = 0.8815 to 1.7855). Among the human infective assemblages, assemblage specific molecular detection revealed the rate of infection of assemblage B was comparatively higher (60.30%) than assemblage A. 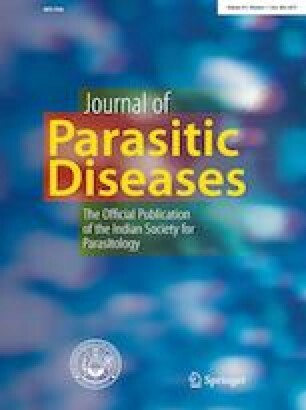 The authors want to acknowledge Department of Medicine and Department of Microbiology of Silchar Medical College for providing samples. Authors also greatly acknowledge The Molecular Parasitology Laboratory of Gurucharan College Silchar funded by DBT, DST and UGC for helping in molecular analysis under this study. We are grateful to Prof. Jaishree Paul, School of Life Sciences, JNU, New Delhi for providing all the positive controls used in this study as a kind gift to us. We would also like to convey our sincere gratitude to Prof. Sankar Kumar Ghosh, Vice Chancellor, Kalyani University, West Bengal for helping in the sequencing part in his previous laboratory of Dept. of Biotechnology, Assam University, Silchar. This research did not receive any specific grant from funding agencies in the public, commercial, or not-for-profit sectors. The study design, aim and methodology were prepared by Dr. Baby Singha and Dr. Shubhadeep Roychoudhury. All the clinical samples along with patient details were provided by Dr. Debadatta Dhar. The experimentation, data analysis, statistical analysis were done by Dr. Madhumita Roy. The manuscript was prepared primarily by Dr. Madhumita Roy and further checked and modified by all the co-authors. The research leading to these results has received funding from UGC, DBT and DST grants given to the Molecular Parasitology Laboratory, Department of Zoology, G. C. College, Silchar, Assam. The protocol of the study was reviewed and approved by the Institutional Ethical Committee (Ref. No. GCC/9440) of Gurucharan College, Silchar, Assam, before the commencement of the Study and Silchar Medical College and Hospital, Silchar, Assam. For the present study all stool samples were collected with the consent of each patient/subject, in the form of questionnaires. All study participants had given written consent before enrolment into the study. On behalf of all the infant participants consent had given by the parents/guardians.